posted January 29, 2015 01:30 PM bonus applied by angelito on 21 Feb 2015. Edited by potmdehex at 11:55, 09 Aug 2015. Note that some of these maps have not yet been patched for balancing/other fixes and the ones that have can be tweaked further. This is an initial BETA release. If you like this project, please make a charity donation at http://hopeinaction.se/en . I'm ready to pay for a tool which converts WoG to SoD and classic versions to each other. Well, the underlying code has been written with future support for WoG and other modifications in mind. This tool so far does AB->RoE and SoD->RoE. Further into the future it is also not impossible to achieve H2<->H3 conversion. We have a converter tool which transfers H2 terrains to h3m, but nothing farther than that. 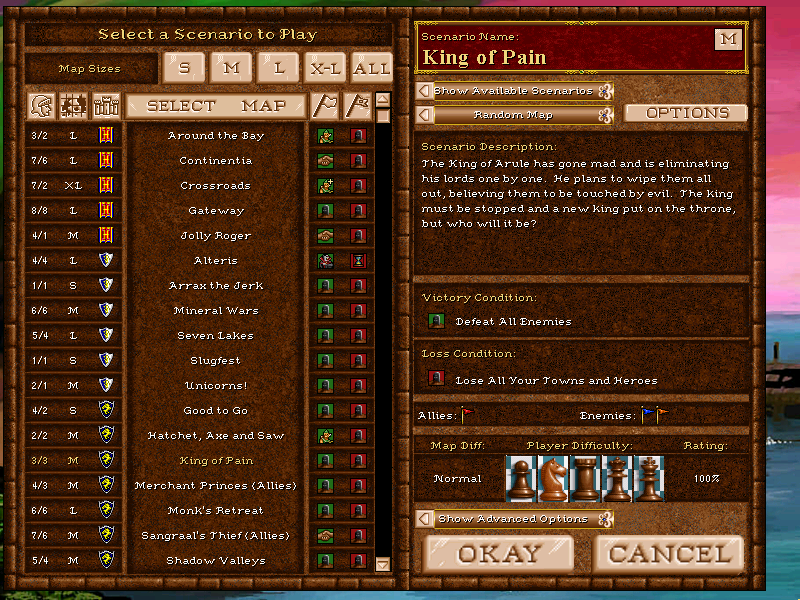 Converting WoG to SoD and SoD to AB/RoE would be a huge assistance for the succession wars mod map list, since we are going to release v0.8 in this year. Thanks for the info, this looks promising for the least. the succession wars mod map list, since we are going to release v0.8 in this year. I'll probably buy the game when this tool will allow WoG <-> RoE convert, or when they'll give support themselves for more versions. As it is now I don't think it's worth it. Donated 100 SEK, not much but our RUR have really seen better days. Good luck in your endeavors. I am really eager for the result. Why would anyone convert wog to sod? Just play it without scripts = sod. Edited by Orzie at 17:30, 29 Jan 2015. We need it for graphical consistency and convenient maps sorting. 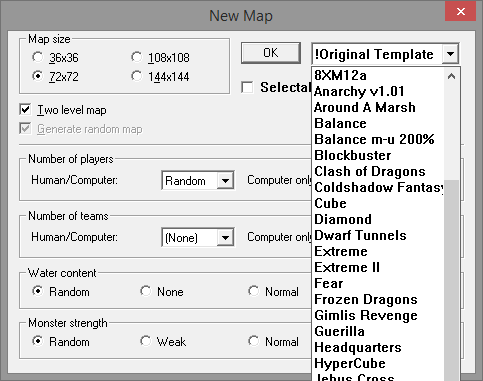 H3SW features H1, H2, H3 and new H3SW maps at the same time (overall 4 formats). The trouble is that all our new maps were saved as WoG when we didn't plan such a graphic improvement. Edited by potmdehex at 04:39, 30 Jan 2015. Wonderful, I hope that in time you shall not be dissapointed. I expect this BETA version to perform poorly at converting non-standard set maps, however this can mostly be greatly improved without a lot of effort when debugging against any incompatible maps (this has been the process to get conversion of all standard maps working). Usually it currently commits seppuku by explicitly dereferencing some 0xDEADC0DE-style pointer when it encounters something unexpected. Edited by Merkuri at 17:39, 30 Jan 2015. I've downloaded converted map pack, tried to play multiplayer (hotseat) but most of the Allied maps teams are messed. E.g Most of the maps don't have enemies at all. // antispam feature herp derp..
That's because you'll have to fix the players by yourself. The tool doesn't do that for you. They decided to lock the game at 33 fps, if you guys somehow could unlock it to make the mouse actually perform as it's supposed to do, i'd gladly give you a tip. 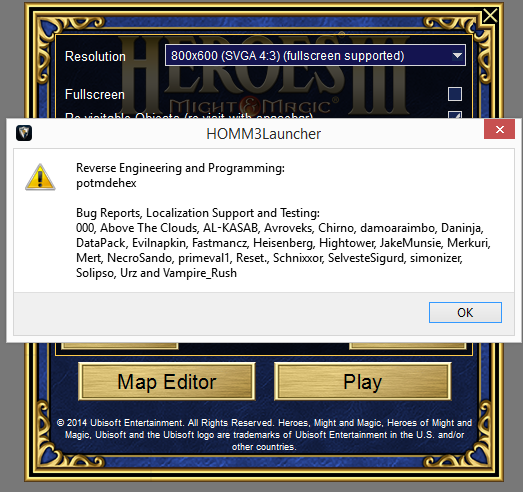 What does it have to do with the map format converting utility or RMG? It doesn't but since someone showed some interest in modding this steaming pile of snow they might aswell try to fix some other issues if possible. Edited by potmdehex at 14:43, 31 Jan 2015. New version and new converted AB/SoD maps set available now. The 26 maps that were missing from the last converted set upload have been fixed to be HD Edition compatible and are now included. Also, the Allies bug reported by Merkuri (thanks man) has been fixed. The tool aims to convert everything, so anything that is not/is incorrectly converted is a bug and so I appreciate any bug reports. New video and more details coming soon. As Orzie has pointed out there are some issues with converting players. This is due to the fact that there are some pretty vast differences in how town types are represented between RoE and AB/SoD (even AB and SoD are not the same as each other, but closer). Right now it seems to me that for some configurations, the player structure simply cannot be converted to RoE using only information from there. Tomorrow I will look at making code that peers into the object section to solve this. Random Hero objects placed right outside of towns also come into play here. Both the links link to the same file, and that's the "h3mtool beta 0.1"